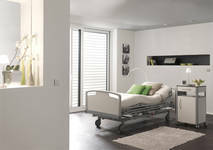 Haelvoet is a manufacturer of healthcare furniture. More than anybody else, Haelvoet has mastered the art of uniting innovation with ultimate comfort and attractive design. Since 1931, those values have been the cornerstones in manufacturing high-quality furniture for both hospitals and nursing homes. The company’s rich history and enthusiastic spirit are the ideal incentives to create unique furniture that keep the balance between design, quality and functionality. The combination of innovation and tradition – two seemingly incompatible concepts – makes the furniture of Haelvoet so special. Haelvoet always applies the newest and most advanced technology, without forgetting our long-standing tradition of quality for customer’s benefit. Thanks to our subsidiary, and multiple partnerships with international companies, Haelvoet has established an extensive product portfolio and has gathered the necessary know-how to complete total concepts. Haelvoet creates furniture full of care. Our furniture offer ample benefits to everyone involved in healthcare!